World War I was the age of the "knights of the air." Aircraft were new, and their role as a weapon of war just being invented. By World War II, the machines were much more sophisticated, and much more critical to the plans of an ground commanders than ever before. World War II was a new age of aviation and a new age of warfare â€“ and now, Wings of War goes to the beginning of this new epoch. This is The Dawn of World War II. Now Wings of War has expanded to include the flying machines and battles of World War II with Wings of War: The Dawn of World War II! The WWII series of Wings of War is an easy, fun to play, fast and furious system which fans of Famous Aces and the rest of the Wings of War games will be able to start playing minutes after opening the box! 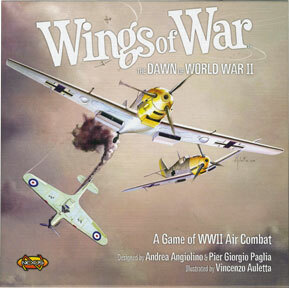 Wings of War: The Dawn of World War II includes fighter planes from the first years (1939-1941) of the war â€“ pilot a Spitfire, a Messerschmitt, a Hurricane. Outfight, outthink, and outfly your opponents with the innovative and viscerally satisfying Wings of War maneuver system. Up to 6 planes can fly with the contents of this set.